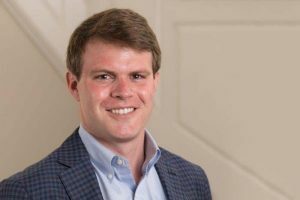 Chip joined Conley Griggs Partin as an Associate Attorney in June of 2018. His practice focuses on catastrophic personal injury and wrongful death involving automobile accidents, defective products, dangerous drugs and medical devices, and negligence. Prior to joining Conley Griggs Partin, Chip worked as an associate for a regional insurance defense firm in Atlanta, providing him with a unique understanding of the strategies employed by defense counsel in building its case. Chip earned his B.A. in Political Science from the University of Georgia in 2013. He then earned his J.D. from the University of Georgia School of Law, where he was a recipient of the Keith Mason Law Scholarship. While in law school, Chip served on the Editorial and Managing Boards for the Georgia Law Review and as a research assistant for Professor Julian Cook. Chip was admitted to the Georgia Bar in 2016. Chip grew up in Atlanta and has lived in the Virginia Highland neighborhood since relocating from Athens after law school. When not in the office, Chip enjoys playing tennis, cooking, traveling, and watching UGA football.